Heat oven to 350°F. Lightly coat a baking sheet with cooking spray or line with parchment paper and set aside. In a small bowl, beat together the powdered sugar and cream cheese. Separate the dough into 8 triangles. Spoon 1-teaspoon cream cheese and 1/2 teaspoon pumpkin butter onto the short straight edge of each triangle. Loosely roll up the crescent, starting at the short side and moving towards the opposite point. Place rolls point-side down onto the prepared baking sheet, then curve into a crescent shape. Repeat with remaining crescents. Bake crescents for 13 to 14 minutes, until golden brown. Serve drizzled with caramel and topped with pumpkin seeds. 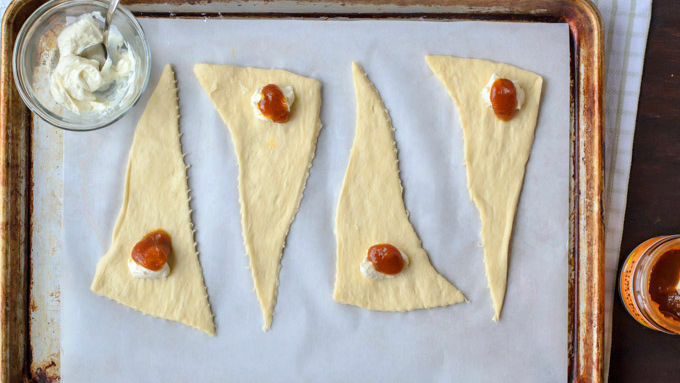 These easy-to-make crescent rolls taste just like pumpkin pie. Let’s talk holiday food institutions. We have turkey. We have fruitcake. We have challah and kugel. Then we have the Pillsbury crescent roll. Growing up, any night that my mom served crescent rolls with dinner felt like a special occasion. Pigs in a blanket were a really special occasion and required finishing our broccoli to earn second helpings. It’s only been in recent years, however, that I've been exposed to the crescent roll as a versatile, endlessly customizable vehicle for easy entertaining. The latest example: Pumpkin Pie Crescent Rolls. 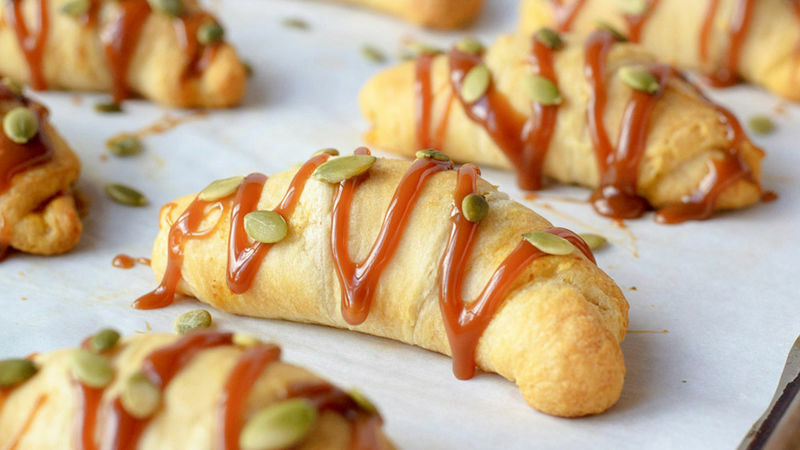 Fluffy crescent rolls with a creamy pumpkin filling, caramel drizzle, and a final flourish of toasted pumpkin seeds, these sweet bites are easy to make and impossible to resist. Plus, as I discovered, adults tend to go just as crazy over anything made with a crescent roll – just as I did as a kid! In only three steps, you’ve created irresistible pumpkin treats that are destined to be a hit at any holiday party. *Applause. * Whether you’ve had your holiday spread planned for weeks or are still not sure what to serve, these are an easy, crowd-pleasing addition to any menu. Just don’t be surprised when your guests request them again next year – Pumpkin Pie Crescent Rolls are holiday institution material!